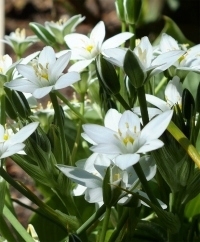 A Greek name loosely translated as bird's milk, the genus Ornithogalum has over 150 identified species although only a handful are grown commercially. 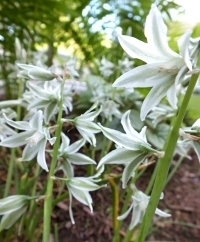 Native to the temperate climates of Europe, northern Africa and Asia Minor as far back as the 16th century, they have star-shaped white flowers with green stripes on the reverse (with the exception of O. nutans Silver Bells). 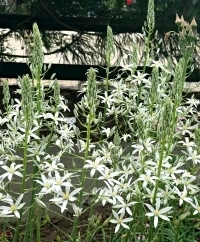 All known to be good cutting flowers, deer- and rodent-resistant Ornithogalum are excellent for naturalized garden display. Each variety prefers adequate moisture, well-draining soil and the protection of mulch in colder micro-climates. When it’s extremely happy where planted as it matures over time, it can naturalize by both bulb offsets (baby bulbs on the sides of the mother bulb you’ve planted) and, in some cases, self-sowing seed. 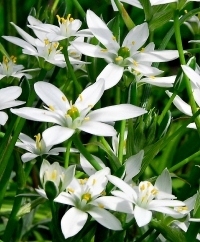 Ornithogalum is The Art & Soul of Spring™.